A hot, humid day today with little wind until afternoon. The crew spent most of the day organizing the area below decks, getting luggage ready for their stay in port, and generally tidying up the deck. At approximately 14:00 a large whale appeared several hundred meters off our stern. We heard it breathe several times before we spotted it, but it was too far away to identify or photograph. Apparently a large number of whales inhabit the seas off of Sri Lanka, so we’re hopeful we see some up close on the next leg. The crew held a small celebration for Geoffrey Dobbs today. He has been with us since Cochin and has contributed in many ways to the success of this leg of the voyage. He will be leaving the ship here in Galle. Captain Saleh gave Mr. Dobbs a canvas certificate of appreciation for his efforts, and the entire crew wished him well in all his future endeavours. We are now only seven nautical miles from Galle. 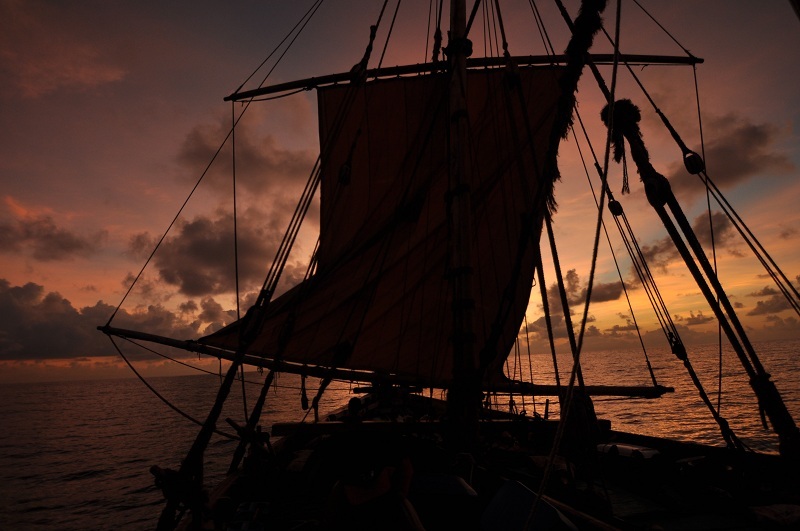 It is still dark and our sails are down. We plan to raise the main sail in about an hour to make our final approach to the harbour, at which point a Sri Lankan naval ship will tow us to our berth. It has been raining off and on for most of the night, with spectacular lightning to the south. We’re hopeful that the rain will not affect the welcoming ceremonies planned by Sri Lankan and Omani officials. At this point, the plans are for the Jewel of Muscat to be in Galle for only five days–just long enough for a new mast to be installed, fresh provisions loaded, and the crew to get some rest before beginning the voyage to Malaysia. Please continue to check the website for additional photos in the coming days.